The term 'mesiodens' refers to a supernumerary tooth occurring in the anterior maxilla located between the maxillary central incisors. This is the most frequently seen supernumerary tooth followed by maxillary lateral incisors and mandibular premolars. The prevalence of mesiodens ranges from 0.15 to 1% of the population, and they occur more frequently in men than in women with a ratio of 2:1. Numerous theories have suggested possible etiological factors such as extra divisions of the proliferating dental lamina, palatal offshoot from continued activity of the dental lamina after the normal number of tooth buds has formed, dichotomy of the tooth bud, and proliferation of odontogenic cell rests. Talon cusp is an accessory cusp-like structure projecting from the lingual surface of primary or permanent anterior teeth, and extending half the distance from the cementoenamel junction to the incisal edge. It has a striking predilection for the maxilla over the mandible, and the majority of cases occur in maxillary anterior teeth. The occurrence of the talon cusp in a supernumerary tooth is an extremely rare phenomenon, with only 5 case reports until now. In all of them, talon cusp occurred in either conical or supplemental type of mesiodens. 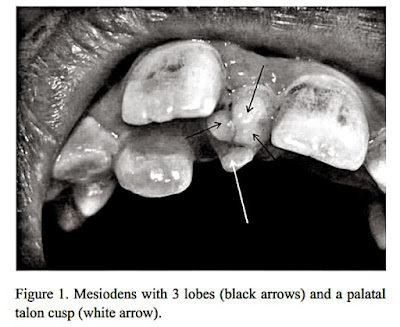 This paper presents a case of development of the talon cusp in a mesiodens with multiple lobes.